Ipswich launch a great success. Well done Mhairi and Diana for putting Ipswich 1230 The Womens Company back on the map. Today I visited 1230 Kingshill who meet in the Observatory Restaurant in The Spitfire. It was a truly rewarding visit. Over the past few weeks I have attended 1230 meetings at East Grinstead, Hastings, Sevenoaks, Beckenham and Chislehurst and today’s meeting really confirmed to me how much business is done now at 1230 meetings and between members. Today I bought a TooJays handbag .. and I wasn’t the only one! I spoke to Yvette who had a great fund-raising idea for Ovacome and I got a good tip from Karen of Utility Warehouse on how to reduce my bills even more – I am already a UW fan! I heard many testimonials from members about other members which I look forward to seeing posted on the website so that everyone can read them. I am also keen to hear what 1230 Kingshill members decide to do to raise funds for Ovacome – Anna and Jane had a very good idea and I do hope it will go ahead. Fantastic news too – at least two business women who were at the meeting are seriously considering becoming 1230 managers. 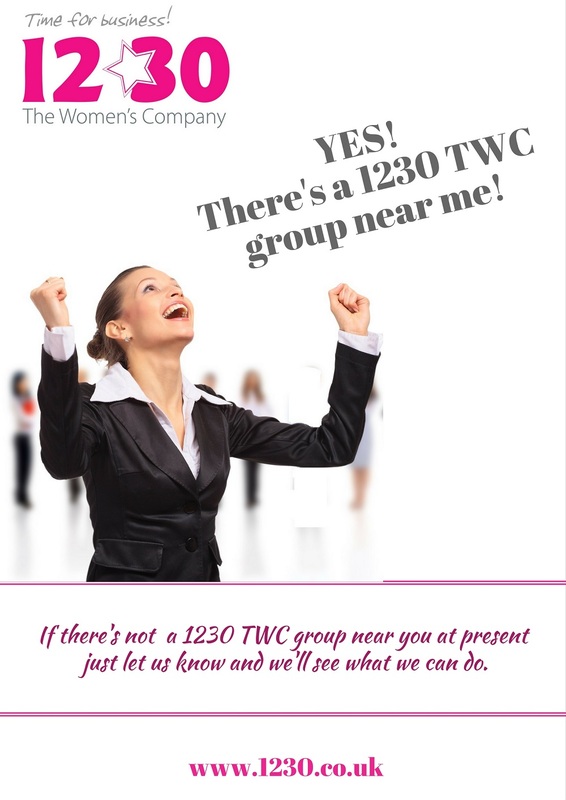 The more groups there are the greater the opportunities for all business women to take part in a 1230 group. Of coure there is no excuse for any business women in the UK not to attend 1230V (V = virtual!) our monthly online telephone conference – details of next one are in the March section of the Meeting calendar. Thank you to Beverley, Kate, Caroline, Clare, Jan, Anna and Jane for the inspiration you have given to me and to all the 1230 members and others who attend your meetings. What do you think of ‘The Secret’? On the 1230v teleconference meeting last week, Suzanne Henwood www.HenwoodAssociates.co.uk gave a superb ten minute introduction to the theory behind the controversial book and DVD, ‘The Secret’. Among the questions raised were: “Can we really decide what we want from life and then just sit back and expect it to happen?” “If we are responsible for everything that happens in our lives, why do we end up with things we definely DON’T want – like illness and bereavement?” Suzanne, ably abetted by Beverly Hamilton, gave some fascinating explanations on the thought processes and techniques that can be used to harness the power of our minds. If you would like to suggest a subject for a future ‘v’ meeting or would like to do a ten minute talk to introduce a topic please get in touch. ‘v’ meetings are on the second Monday from 12.30 – 1.30. 1230 Purley meetings have now merged with 1230 Croydon and will meet on the 1st Tuesday of the month at Kelong Selsdon Rd, South Croydon. (Nr the Swan & Sugar loaf) The Kelong offers supurb Malaysian and Singaporean food. So join Val and Myself (Charlotte) for a drink, a main meal and a coffee on Tues 4th March at The Kelong. Last Friday was an exhausting but by equal measure, exciting day. I had the pleasure of interviewing 6 applicants for the roles of 1230 Managers. Two I’d met previously Fiona Syrett who is starting a group in Woking and Rhian Wheeler who is starting a group in East Dulwich with Lola Fayemi. Penny Walters is going to continue running the Bristol group, Meera Winder will take-over Kingston and Teresa Leong will be running Wimbledon. What great business women they all are, and how well prepared they’d come for the day. Their 2 minute talks on “The Value of Networking” needs to be packaged. Each was enthusiastic, totally understanding the effort required in building those business relationships. I’m very much looking forward to working with them all. A BIG Welcome Girls! “Hard to pick out anything as most useful because I found the whole session extremely valuable”. I’ve just attended a 1230 meeting from the comfort of my own home, and on a day like today that’s a real bonus! Joining is simple – you just have to dial a number – and it costs very little. Penny talked us through all the features of the new 1230 website and showed us how easy it is to use it to promote our own businesses. It’s given me lots to talk about at my first 1230 Woking meeting next week – I will definitely be promoting the website as terrific ‘added value’ to 1230 membership! With my kids off on holiday it’s been a fine line between being available to chat, play Monopoly, go shopping, beat them at bowling and working. It’s the same for most working parents but it made me think about how I use my time. With mounting to-do lists, big projects with short delivery dates, consuming workloads, growing obligations and festering unfinished tasks, it’s no wonder in this what-have-you-done-for-me-today world we often feel time deprived. I am very passionate and enthusiastic about my work and because I love it so much it doesn’t feel like work but there is also a down side to that in that I don’t know when to stop, close the door and switch off and I also expect everyone to feel the same about my work – which is just plain barmy of me really. Work-life flows into home-life, and balance becomes imbalance, and goals and dreams get relegated to “maybe another day” shelf. If this sounds familiar, you’re not alone. In a recent “Winning at Working” reader survey, the most common work problem was related to time. Overwhelmed. Overworked. Overstressed. Too much to do and too little time to do it. But here’s the reality. No matter how much we do, we will never get everything done. There isn’t enough time for all that needs doing, all we want to do or we’d like to do or we should do. There never will be, even with the most sophisticated productivity, organisational and time-management approaches. Of course, they’re helpful, but thinking the chaos and stress in life is caused by not having enough time is a big mistake. You see, the problem is not a time problem. We all have the same amount. It’s a choice problem. The choices you make determine whether you’re running your life, or your life is running you. And you do have choices. Naturally there may be consequences to saying no, establishing boundaries or reordering priorities but there are also consequences if you don’t. All tasks are not equal. All commitments are not equal. All responsibilities are not equal. All clients are not equal. All people of personal importance to your life are not equal. Yet many of us operate as if they were. You can do fifty things today and get little, if any, result for having done them. Or you can do one or two that bring a big return, be it emotional, financial, physical or psychological. People who are winning at working know the difference and operate accordingly. They see time as life’s currency and how it’s used as a choice. Choices shape your results and your life. You get the same twenty-four hours each day as your co-worker sitting next to you. But use differs. Practice the piano eight hours a day and you’ll be better than people who don’t. Practice and hone your workplace talents and the same applies. Or spend time getting ready to work, stopping to chat, surfing the web, fiddling with your emails and you’ll complete the day having traded your time for minimal results. How you spend your time puts value on what you’re spending it on. Many people never have “time” to exercise consistently until a health issue causes them to re-prioritize their choices. Funny how they manage to find the hours when they have to isn’t it? Choosing to eliminate an hour of television a day could create 365 “found” hours a year. That’s nine weeks! People who are winning at working know this secret: because there is always time for what matters to them. So, they allocate their time carefully, understanding their life as a reflection of their choices. They make time for the people they love, the passions they have and work that uses their uniqueness. They focus on the results, goals, and life-dreams they desire, rather than accepting what comes their way. They do, while others talk of doing. They plan their day, while others let their day plan them. They motivate themselves, while others wait for someone or something to motivate them. For people who are winning at working, it’s not about the time they have; it’s about the choices they make in how to use it. So what could you do differently today to take control of your time? The days of not talking to strangers and not accepting sweets from them have long gone, as your child can make friends with people from around the global community in an instant. But how do you know who they are talking to and how do you monitor and keep a watchful eye on their activity? How do you keep them safe from paedophiles and away from inappropriate situations that can intimidate, terrify and overwhelm them? The internet is a valuable, exciting resource for children and adults alike but there are potential dangers associated with its use, especially for children. You may not have grown up with instant chatrooms and social networking forums but that’s not a good enough excuse to bury your head in the sand and let your children have free reign on the Internet without some proper supervision – it can be a dangerous place to play. But don’t panic – there are a number of simple measures you can follow to help ensure your child’s safety online. Do: Talk to your child/children about how they use the internet and their favourite sites. Encourage them to show you how they access the net and to talk to you about any concerns they may have regarding online chatting. Show an interest rather than point an accusatory finger of distrust at them. Your child will feel reassured and safe if you show a balance of respecting their way of communicating but keeping a watchful eye on what’s happening. Do: Keep the computer in a public place in your home – if a predator sees a bustling living room or kitchen in the background on the webcam rather than just a quiet child’s bedroom, he will probably be less likely to embark on attempting to groom your child. Do: Remind your children that any people they only know through the internet (and not in the real world) may not be who they say they are. Do: Check the privacy settings covering their profiles on-line. Do: Make it clear to them that you will occasionally check what sites they are using and will also sometimes ask questions to make sure they know the person they’re messaging. Do: Remind your children that anything they post is likely to be visible to the world. Don’t: post any personal information (such as your email address or mobile number) on your profile/s. Don’t: post anything online you wouldn’t want the world to see. Don’t: continue online conversations that make you feel uncomfortable or suspicious about whom it is you are talking to. Report these to the Child Protection Exploitation and Online Protection (CEOP) website via their ‘report abuse’ facility and go and talk to your parents or another adult you trust to help you. Don’t: agree to meet anyone you only know via the internet. Don’t: open any attachments or links if you don’t know (in the real world) the person who has sent them. Don’t: use your real name in chat rooms – pick a nickname just to use online. Don’t: assume that the people you are chatting to online are really who they claim to be. Don’t: keep any anxieties or worries or little niggles to yourself about approaches to you or conversations you’ve had online. Talk to your parents and/or an adult you trust. If not, you can call Childline on 0800 1111. Don’t: accept strangers who contact your online profile as friends say NO or just ignore them. Don’t be tempted to say YES. Don’t: agree if someone suggests keeping your chats a secret – tell your parents or a trusted adult. Keeping your child safe in this new arena needn’t be frightening but you owe it to them to keep up with the fast pace of change and keep them protected.